Does on-demand content lead to on-demand advertising? For the past 300 years or so, media has been a one-to-many broadcast model. But now we see TV, radio and press all moving towards an on-demand model. In a world where content is delivered on-demand, would on-demand advertising be a more relevant approach in the future of broadcasting? I have issue with the process of online media buying. Agreeing a spend budget for the month, researching a handful of websites, a few phone calls to negotiate the rate, booking a volume of impressions, signing an insertion order before sending over the ad-serving tags. It feels too rigid, too simplistic, but most of all too much like offline media buying! But is that all about to change? Doritos, the tortilla corn crisp brand owned by PepsiCo, has launched a new online campaign to engage users with an interactive website, user generated content and strong links to social networking sites. Historically, FMCG brands have been slow to embrace online marketing as they have struggled to deliver a compelling creative message and measure the effectiveness of their campaigns. 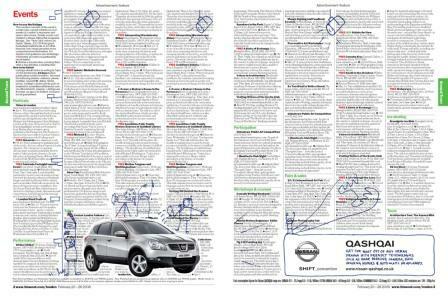 Flicking through my morning paper, its clear to see that the online overlay ad format has influenced Nissan in its campaign to drive awareness of it new model. Can the affiliate model evolve? With the popularity of the last click model dwindling, do affiliate networks need to evolve their approach to tracking sales in order to remain a viable channel for advertisers? Killer creative or optimised results? Is it enough to have just one killer creative execution, or are numerous variations required to achieve maximum performance? With overall click-through-rates falling, advertisers are increasingly looking for ways to optimise online campaigns to improve results.